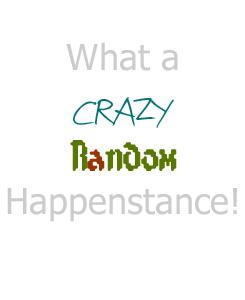 About : What a Crazy, Random Happenstance! About me….what to say. I was born and raised in a town. Not too small but not that big either. A farming town even though most people are no longer farmers. My father was until he broke his back but I never lived on a farm. My mother refused she was from the big city and the thought of all those bugs… you get the idea. All I ever wanted to do was escape. Now that I’m gone I wish I could go back. I do like living in a place were there is lots to do but would love to raise my daughters in a small town. That’s what I do. I take care of my family. I cook, I clean (sometimes), I do laundry, I kiss boo-boos, I give time outs, I yell at my husband, I say I’m sorry, I teach pre-school, I dream about far away places, I jump for joy when I get to go shopping on my own, I don’t wear make up, I have a billion ponytail holders (even some scrunchies! ), I cry at commercials even if their not sad, I drive a mini van, I read, I sing, I love bear hugs, I snuggle, I tickle, I yell some more, I worry and so much more. I’m a mom and I love it.